So my Prestashop tutorial is going to teach you how to do exactly that. I’ve seen a range of crazy advice because there are a lot of moving parts like setting up a payment gateway and the automated digital delivery system. But today I’m going to show you just how easy it is to sell digital products online with the free PrestaShop Ecommerce CMS system. Why Sell Digital Products Online? Owning & selling your own digital products online is a great way to make money. It ensures that you are in control of everything and once you have created a digital product – you have unlimited stock to sell. You can create digital products in any niche about any subject. You will spot the trend that every niche leader has their own free & premium products. This is especially effective when combined with an ecommerce SEO strategy that brings sustainable qualified traffic to your store. Owning your own products is one of the easiest ways to make money online. There’s lots of examples of people that do this including myself as you can see with my Rank Cracker product which I made available for free. It’s a simple piece of software that analyzes your competitor’s backlinks but then that upsells to a 97 dollar upsell which looks like this. This is just a collection of my premium tutorials that aren’t available anywhere else which are available for purchase for 97 dollars. So far since I launched my free product in upsell it’s made over twenty one thousand dollars. Twenty one thousand, eight hundred and seventy-three dollars to be exact. We also had a guest post earlier this year by Steve Brodsky who showed us how to create and launch a profitable product step by step. With his product the List Builders Academy he generated over fifty-seven thousand dollars from his launch which started with a free product and then upsold into his main product. So I hope you can see the value in owning your own product as it gives you the complete freedom to sell it as you wish but once you’ve created your product, how do you sell it? You need a very easy to use E-commerce platform that allows for digital e-commerce selling. For that we’re going to use a completely free Prestashop. One of the simplest and best ways to make money online is to create your own product and sell it. Not only can you create a product in every niche out there but making it in digital form means you have unlimited stock to sell. My own product, Rank Cracker is software for analyzing competitor’s backlinks is completely free but it upsells to this $97 product. Since I’ve launched my free product, I’ve made over $21,000! If you’re convinced yet that you should create your own product, Steve Brodsky wrote a guest post showing how to create a product that has generated over $57,000! Once you’ve created your own product, you need to establish a platform that makes digital e-commerce selling easy and we have Prestashop to do that. Prestashop is essentially the WordPress of the E-commerce world, it has a similar layout on the backend and is very easy to work with. You can customise everything easily with themes and modules which work much like plugins do in WordPress which is why you should use Prestashop to sell digital products online. What makes Prestashop really cool though is its built in functionality to handle digital products and deliver them securely and over the course of my Prestashop tutorial, I am going to show you exactly how to do that. Prestashop is a completely free open source script that anyone can use to build an e-commerce website. To download it, just hit the homepage and hit the download for free button. The reason it is so good is its search engine friendly allows you to sell downloadable products easily which many e-commerce content management systems don’t allow you to do. And this is what the default install looks like so you can see it is a fully featured e-commerce store. If we go into one of the products here you can see all the details you need to do including the price, you can have variables such as color and social sharing icons here. We’ve also got a range of images which you can enlarge and data and information about the product. So this provides the perfect framework for us to sell our digital products with a few tweaks. If we jump into the backend of Prestashop you can see the dashboard showing all of your sales, your sales forecast, all of your traffic and you can actually connect your Analytics account to get even more data pulled into this dashboard directly. You can take a look at all of your orders, all of the orders that need processing, your best selling products and so on. Prestashop really is trying to be the WordPress of the e-commerce world and you see the sidebar and set up is very similar to the wordpress admin backend here. So that’s why we are going to us Prestashop, it’s free, very easy to use and has all of the functionality built in to deal with digital products and the delivery of them from the get go. A lot of e-commerce management software don’t let you sell downloadable products but Prestashop does. Let’s take a quick look at what it offers. As you can see you can include many different details like price, color, social sharing buttons, pictures and more, giving us the best foundation to sell our product. In the backend of Prestashop, they give you details on your orders, sales, traffic and things like that. You can also connect your Google Analytics account for more data. So with all of the functions Prestashop offers, it is the ideal software to set up your e-commerce website. It’s 100% free and has all of the appropriate features to sell a digital product. To get started with Prestashop you need a domain & hosting. You can get that along with a 1 click Prestashop installer for $2.75/month with JustHost which is exactly what I did in the video below. If you already have a domain & hosting see if Prestashop is available to install via your control panel and if not please read the technical documentation. Now to setup Prestashop the first thing that we need is a domain and hosting. If you’ve already got that, log in to your hosting’s control panel and find the one click installer and you may find that Prestashop is available to install in just a couple of clicks. If you haven’t got a domain and hosting, I suggest you head over to JustHost, they have it in the One click install which I’ll show you in a minute and is very cheap to pick up your hosting and domain here. On top of that you also get a lot of ad credits free which you can then use to promote your digital products later. So the JustHost homepage and hit sign up now. Next you need to come up with a domain name so I’m just going to use yourdigitalshop.net for example and click next. Then just complete the check out information and submit your payment so I’m just going to pause the video while I do that. Once your account has been set up you’ll receive an email like this and you want to log in to your control panel which looks like this and then find the section called Mojo marketplace and click on One Click Installs which will bring you to a page like this. On the left select e-commerce and then Prestashop. Once you do that you’ll be given a little bit of information about it and you can select a live demo if you want but we’re going to install a brand new instance here. We want it to be in the root of our domain here so this will just check that everything is set up for us properly. Then you can choose to configure some of the advanced options like the shop name, so I’m just going to fill those out, My digital shop, Matthew Woodward, my email address and then just update the admin password. Once you’ve done that click I have read the terms and conditions and click Install now and that will go and install Prestashop to the root of your domain for you automatically. Once the installation is finished you can click to view your credentials here and find your main URL and your admin URL. 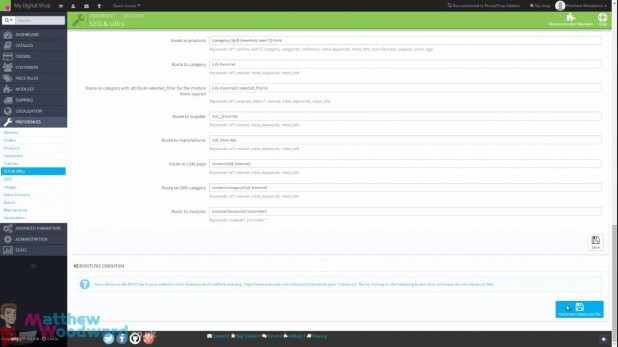 So if we just log in to the admin area quickly, in the back end you can see it has loaded our dummy data for us just to give us a look at how everything fits together and we can also navigate to the front end of the site and you see the test site all loaded with dummy products and data for us. So that’s it, you’ve now installed Prestashop and we can move on to setting up the basic settings, customizing the theme, setting it up to sell digital products, and setting up all of our payment processes so let’s move on. Find Mojo Marketplace and select One Click Installs. It’ll bring you to the marketplace’s section for One Click Install applications. They’ll give you a bit of info about Prestashop so click on Install. Then select which domain you want to install it on, configure some advanced features and agree to the terms and conditions. Once it’s completed, it will take you to a new page that gives you the practical information of your new Prestashop site which you can log in directly from there. You can login to your Prestashop site using the admin username and password you set up earlier and see that the dummy data has been loaded in there already. Now we’re ready to set up our theme, customize it to our personal taste and get it all set up! Once you have installed Prestashop we need to go through the basic settings and make sure everything is setup as we need. Don’t worry if you are not sure what some of the settings do as I will explain each of them as we go! So now it’s time to take a look at the basic settings of Prestashop. But before we do that I want you to spend some time familiarizing yourself with the dashboard and the backend. So just have a click around, go into some of the dummy products here, looks at how everything’s set up and how everything pieces together. Really spend some time familiarizing yourself with everything and seeing how everything plugs together. This will make your Prestashop experience much more enjoyable. And one you’ve had a click around and you feel comfortable with everything, the first thing that we need to do is come into the module section and there will be an number of modules that need updating which you can see here. So if we come to the top right corner and click on update all, that will go out and update all of the modules for us in one go, so do that. Once that’s complete, you will see a message like this one and if we just come back to the module section we should now see that there are no modules to update. Now before we start digging through all of the preferences and setting all these settings up, when we installed Prestashop it also installed a range of dummy data. For example we got all of these recent orders loaded in, sales stats, if we come into the catalog there are already a range of products set up. Now what I want to do is delete all of this dummy and sample data so that I can begin to set up my own products and product categories without all the dummy and sample data getting in the way. So once you familiarize yourself with the dashboard we can then go about removing all of the dummy data. The first step to that is if you come to the dashboard here and turn demo mode off, you will see here all of these graphs flatline based on our actual orders. Once that’s done we need to go to modules and then modules and scroll down to the search here and do a search for cleaner and you will see the database cleaner here. Just install that and then you will see a screen like this. So we want to click yes to delete all of the catalog and delete all of the orders and customers, and we can just delete the catalog here, hit OK. That will now delete all of the dummy catalog data for us. Once that is done, you will see the catalog truncated message here. Now we can do the same for orders and customers and you see that has been completed here. Next we want to check and fix the integrity constraints because we’ve just deleted a large amount of data from the database and you can see that has fixed. And last but not least we want to do the database cleaning and optimization and you can see that has completed for us there. So now when we go to our catalog you will see no products existing, we have no product categories anymore, we have no ordered data and no customers so we’re now working with a completely blank install. So let’s take a look at working through all of the preferences and settings. So if you go to preferences and general, we can start here. Now if you want to enable SSL on your site, here is where you do it, you will need a separate certificate from Justhost or whoever your hosting provider is. Most of these settings you can leave at default, now remember where each of these settings are in case you want to turn them on or off later but the only thing I would change here is the main shop activity is for downloads. And so if we just hit save there we can move on to the next step. Taking a look at our orders processing, personally I like to change this to the one page checkout and enable the guest check out. Now the reason we enable the guest check out is because if you force people to register before they check out, that kills conversion so please make sure you enable this. These we can leave at default, if you want a terms of service page to appear there is one set up by default but I turn this to no personally and you can also offer gift wrapping if you want but as we’re selling a digital product here it will not be relevant so once you’re happy with those hit save. Next we want to come over to the products settings. Catalog mode allows you to disable the transactional part and the shopping cart part of the site so if you want to display a static catalog of products, that’s where you will do it but for us that is irrelevant. You can also redirect people after adding a product to the cart either to the page they just came from or to the cart summary. Feel free to change that to your personal preference. And you can also force the update of friendly URLs, now this is the SEO friendly URLs and make sure that is set to yes. We have a few options with Pagination and how many products are displayed per page which you can change to your preference here. And on the product page itself we have a few options so you can choose whether to display how many products are left in stock. For the sale of digital products we have unlimited stock so we can turn that to no. We can also choose some other options here however they will, the defaults are already good enough for what we want. We can also change some of the stock options down here. Now as we’re selling digital products I tend to disable the stock management entirely cause we have an unlimited amount of product to sell, it’s just a case of sending an email for the most part. So with those setting set, just hit save. And now we can move on to the customer settings. Registration process type, only account creation, that is perfect for our needs. We don’t need address creation because we’ll be delivering the products digitally. Phone number is mandatory I turn that to no, there’s no need for us to collect the phone number although if you would like to, just leave that set to yes. Sending an email after registration with he details, personally I like to have that enabled and if you’re happy with those settings just hit save. Next we’re going to take a look at themes. Now I’m going to do a bit more of a dedicated section on themes a little bit later on but this is where you come to manage all of your different theme options and change themes. So for now we don’t need to worry about that and can just move on to SEO and URLs. Here you can see all of the different pages we’ve got created and you can change the page title and the SEO URLS here if you want to. But what we’re more interested in are the settings down here. Now by default these settings are already pretty good, there’s not really anything you need to change here. The only thing I would change is just this drop down here, redirect to the canonical URL as a 301. That’s the only thing I would change on this page. And once you’ve done that, hit save. Alternatively you can also create the robots.text file. And you do that at the bottom and just click on the generate robots. Text file and this will just help point Google towards your site maps and where it should be and spidering and blocked from spidering so make sure you do that as well. Now let’s move on to the CMS options. Here is a list of all of the static pages which is delivery, legal notices, etc. etc. If you want to edit then just come along and click on the edit button here. And you will see a, what you see is what you get editor to edit the content along with the ability to set your meta title, keywords, the SEO Url and whether its indexed by search engines or not and whether the page is visible on the site. So just remember that is where you manage all your static pages, right now we’re just going to leave that at the default. Moving into images. Again the default options here are good enough. This will automatically create all of the different sized images that you need when you upload them along with your product and if for any reason you need to regenerate thumbnails because things go wrong or after making a lot of changes things don’t line up right, you just come into this section here and click on regenerate thumbnails. Moving on to store contacts. If you have multiple stores for example, Brick and mortor businesses this is where you come in and add your different stores which will then be made up of part of the store finder but as we’re a digital product seller, only residing online we can select all of these and delete them. Once they have been deleted you just want to turn off display in the footer and click on save. And once saved move on to the next section which is search. At the top of the page here you can see references to previous searches so let’s just select those and delete them. And once that is done, you can leave the rest of the search options at default if you ever want to come and change them and give different results more weight than other things you can come in here and do that. But the default settings are fine for us. We can move on to the maintenance tab. Now in the maintenance tab we don’t really need to do anything. This is just given as the option to turn on or turn off the shop while we’re working on it but seeing as it’s not live yet or we’ve not actually gone out and advertised anywhere, we can keep the shop enabled. The final setting under preferences to take a look at is geo location. So if we want multiple versions of our sites to be showing to different countries this is where you do it. You can enable geolocation by IP address and then decide which version of this site different countries see. Seeing as we are going to just be selling digital products it really doesn’t matter. We can just leave this at default and click save. And that is all of the basic settings for Prestashop set up. Before we move on I’d just like to show you some of the advanced settings here. We just have a little look around but the main one I want you to be aware of is once the site’s set up and ready to go we can actually improve the performance load time of the site just by coming to advanced parameters and performance and by coming down here and enabling CCC which is combine, compress and cache. So you can just turn these options on, only do this once the site is complete and then also caching use cache set to yes down here and just use the file system cache by default and press save. Now you only want to enable this once your site is completely set up so I’m just going to undo those settings because we’re not ready for that yet but once you have finished setting everything up and you’re ready to go live, be sure to come back into advanced parameters and performance and enable all of the caching which will improve your site load times and performance across the board. After you’ve logged into your Prestashop account, take a quick look around just to get familiar and see how it’s set up. After you’ve done that, head over to Modules. Now when Prestashop was installed, it loaded a bunch of dummy data in there which we need to delete so we can accurately see the stats for our products. Go into your dashboard, scroll down and look for Live Demo on the right hand side. Tick the bar so that the demo mode is off and you should see all the graphs and data go to zero. Let’s go back into Modules and Modules again. In the Search bar look for Database Cleaner which we’ll use to delete the preloaded data. Install the cleaner and it’ll bring you to a screen warning you about what you’re going to do. Since we need to get rid of all the dummy data, go through and delete information for catalog, orders and customers. Make sure to also check and fix the integrity constants since we did delete a ton of info so do that and also click the optimization. Now our catalog is nice and empty! We can now move onto customizing our preferences. So now head on over to Preferences and go down to General so we can configure some of the settings in there. Most of them you can leave at default but you can enable SSL here if you want to, just make sure to get a certificate from your hosting provider. The important one to change is the main shop activity to be Download. After you hit save, go down to Orders. For my personal preferences, I prefer to change them to one page checkout and to enable guest checkout, that way customers don’t need to make an account before purchasing which can kill conversions. The next one to look at is Products. You’re able to change the catalog mode, choose where to redirect customers after adding products to a car and set yes to to Force Update of friendly URLs which is important for SEO. In the Pagination section, you also have the option to choose the number of products displayed per page, to show the amount of products in stock which is not relevant to us since we’re selling a digital product and the rest can be left at default. Hit save and let’s move onto customer settings. For customer settings, I usually turn the mandatory phone number off and to enable sending an email after registration. That’s about all there is and hit save. Come into SEO and URLs and you’ll see a whole list of our pages that we created and you can change the titles and URLs here if you need to. For now, we want to go down to the Settings section and change the drop down to redirect to the canonical URL to 301 Moved Permanently. At the bottom you can also make a robots.txt file to help Google point to the correct site maps on your site. The next page to look at is the CMS options which includes the static pages. We’re going to leave them at default now but you can change it later on if you need to. Next up is images. Default settings are good for now but this will be where to go if you need to regenerate thumbnails or edit your photos. Now let’s move on to Store Contacts to manage your stores if you have more than one of them but that won’t matter to us being a digital store, so select all the ones in there and hit delete. Tick the box to turn off the display in the footer and hit save. Next up, the search section. Go ahead and delete all of the references to previous searches and the rest of the settings can be kept at default. The next section is Maintenance which we don’t need to do much here. All it is, is choosing when to turn on and off the shop which is handy if it’s live and you’re doing some work on it but as we don’t need to deal with that right now, let’s leave it as on. Last is geolocation. If you want different versions of your website to be shown to various countries, you can change it by IP address here. We’re not done yet with settings, before we move on I want to show you a few of the advanced settings. Once our site is live, there are a couple things we can do to improve the overall performance. Under Advanced Parameters, click on Performances and scroll down to the CCC section. We want to turn all these options on and also tick the box to use cache. Important! Only turn these functions on when the website is completely done. Now it is time to create your first product for sale on your new shop. Don’t worry if you don’t have a product to sell yet just setup a dummy product to get a feel for how it works. We will create the product, add a description, set it up from an SEO standpoint, assign a price and upload images. Now we have all of our basic settings set up we can move on to creating our first product. So to do that, come to catalog and products. And then in the top right corner you want to click on add new product. Here is where we set up all of the information for our product including prices , how it appears n the site and so forth. So the first thing you want to do is to select that it’s a virtual product and give it a name. So I’m just going to simulate the sale of my rank cracker software which normally I give away for free but I’m going to use it as a product in this example and sell it. So you can enter the name here rank Cracker, we want the product to be enabled, visible everywhere and available for order and the condition is new. Then we just need to add a short description and then a longer description and tags so I’m just going to pause the video while I do that. So I have now populated it with a short description and a long description and at this point we can click on save and stay which will create the product in our database. Once that has saved we can then move on to the other options so let’s set the prices. Up here we can choose the retail price of 47 dollars. Now you can also set up tax rules if you need to but right now there is no need we just need to enter the price in the retail price box here and we can see the final retail price of forty seven dollars here. Now we can move onto SEO where we have to give the product a meta title and meta description so I’m just going to pause the video while I do that. Once you have done that again we can click on save and stay. Next we want to move on to associations and this is where we assign a category for our product. So if we click on create new category it’s going to warn us we’re going to lose unsaved modifications but we have just saved our product so there is nothing to lose we can click on OK, and that will bring us to the create category page. Now rank Cracker is a piece of software so I’m going to call my category software, leave it displayed and leave it the parent default category and just paste in a short description here which I’ve already prepared. You can give the category an image along with a meta title and description but I’m just going to keep it simple here. You can also assign meta key words if you wish along with the SEO friendly URL. Once you’re happy with that, click on save and that will create the new category for us and we just need to go back into editing our product which we can do here. Coming into the associations tab and then we can make the default category, Software by just clicking expand all and ticking software here and that’s the default category there. So click save and stay and once you’re happy with that, then we can set up the quantities. Now remember earlier on we disabled stock management when we were going through the preferences because we’re going to be selling a digital product but we have unlimited stock so this isn’t a worry for us so you can make sure that is entirely disabled. Then we move into the virtual product specific setting. So it asks us does this product have an association file. Now this is Rank Cracker it is a windows executable installer, if you were selling an e –book you would have an associated file as the PDF. If you were selling a package of videos you would have an associated file and so on. So I’m just going to pause the video while I fill this out and then we’ll go over it. So I have selected the Rank Cracker installer in the add file menu here and we have a couple other options to fill out. You can choose to restrict the number of times the customer can download the file if you want to, you can also set an expiration date so the file will be invalid and unable to download after this date or you can set for a number of days so the customer may be able to say, make the purchase, they can download the file five times over the next thirty one days and after that they’ll have to get in touch with you to manually support it. Or you can disable these just by setting to zero so once you have set the product or the file you want to be delivered as part of the order, just click on save and stay. Now we can come across and set up the images for our product so if you just click on add files and select your image, then click on upload files, you will see it upload for us like that. You can also add additional images to the product to give the customer a better look so I’m going to add another image now like this. And then we can choose which is the cover image and which has priority just by changing and dragging the order around like this. Once you’re happy with that, click save and stay. So that is the product pretty much setup, we’ve got a few other options here that we’re not really going to use selling a digital product. Features for example if you were selling tvs and as a feature you might list whether it has 4 hdmi sockets or two. If it was a computer monitor you might be listing the dimensions of the screen or the weight for example. Customization allows us to add some other fields we don’t need for a digital products. And attachments you might choose to use for example, if you have a product manual that would allow people to download upfront without buying the product first, you would attach that here. And suppliers again this is more relevant to people selling actual physical products rather than the average digital product. So once you’ve got all of your information, prices, SEO, categories, quantities, the virtual product and images set up, just click save. And that is the creation of your first product. Now just to build the site out a little bit more, I’m going to add two other products into other categories quickly so I’m going to pause the video while I do that. So I’ve now finished setting up the other dummy products which you can see here and if we just take a look at our homepage now, you will see we still got the dummy graphics in from the initial install here. We’re going to look at changing the theme and all of the actual design and appearance shortly. But for now let’s just take a look we can see here the products are as we’ve put them in and we can sort by popular and new arrivals there. And you can see this is what the product looks like, this is the short description we’ve completed, the longer description, you can see that you can send it to a friend nice and easily and it’s got all of the social sharing buttons, you can add it to a wish list, or add it to cart here. And you can see now that’s in the cart, continue shopping. Let’s take a look at the other products, the premium tutorials here, again all the details and information across here. Rank Cracker we got two screenshots with that and you can click on this and turn it into a lightbox so already you can see this site is quite functional. And if we delve, I created a category called SEO and put all three products into that one category just so you can get a look for how it all comes together and here’s the category description that we set, ideally you want 200-300 words here but this is just a sample and you can change whether it’s a list view or more details here or the grid view. So if we take a look at the cart, one of the main things we need to sort out before we move on to the design and appearance is to actually set up some payment options and set up all of the checkout so we’re going to do that next. Now that we’ve got all our basic settings configured, we can add our very first product. Go to Catalog and click on Products. In the top right corner you will see Add New Product so click on that. There’s also an option to set up tax rules if necessary but we don’t need to bother with that right now. Click Save and Stay to save the product into the database. Let’s fill out the SEO part. Under SEO, you can enter in a meta title and meta description. Fill those out and click Save and Stave again. Now we can go to the Associations part under Products where we assign a category to our product. Select Create New Category and it’ll take you to the Category page. For Rank Cracker, I’m going to define it as a software and enter in a short description but there are other things you can add like meta keywords, description and image to your product which you can do so if you wish. Hit Save and it’ll save our new category. Now we need to include that in our products so go back to Products and click Edit. Then select Associations and click Expand All to find the new category we just added. Set that as the default category and hit save. Now the Virtual Product section. The software we’re using for this example is Rank Cracker which is a software for Windows. If you’re not sure what this is asking, for example if you were selling an e-book, your associated file would be a PDF file. All these preferences are up to you so click save once you’re happy with the settings. The next section is Image where you can upload an image to go along with your product. This includes the cover image and additional images the customer can look at. To change the priority of the images, just drag the images around as you want it. So those are the main options we need to set up for a digital product. The rest of them like Features and Customization allows you to provide more information about the product as needed but since we don’t need them, we can leave them like how they are. To give you a better example of what our website will look like, I added two more dummy products to our list. You can see they’ve been added to the homepage and if you click on it, you’ll see all the information we entered earlier including the image, price, and description. Now we know how to add our products! Almost done setting up our e-commerce website. With our products setup we need to setup a payment gateway so the site becomes fully transactional and we can accept payments. Most people will do this with PayPal as it’s very quick and easy to setup which I will show you in the video below. However Prestashop does support a huge range of other payment gateways if you need to use them. So that we have a transactional site, now we need to look at integrating one of the various payment options so people can check out, pay for the product and then the product be delivered to them instantly so do that we come to the module section and here you can browse the available modules by payments and gateways. Now I’m going to install and use Paypal in this tutorial but as you can see there’s lots of other payment gateways for you to choose from. So to install paypal you can come to payments and gateways and hit Paypal here or just in the search box type paypal and the relevant results will appear. To install it just click on the green install button and that will go away and download the module and install it on your site for you. Once it is set up we then just need to go about providing our paypal api settings but first of all we need to make a choice on which paypal checkout service we want to use. Now paypal payments standard is completely free and you can certainly use without a problem. What happens here is when someone checks out they get taken to Paypal, get asked to login to pay, make the payment on paypal and return to your site, this is completely free. If however you want the payment and the full check out process to be made on your site without taking them away to paypal you need to go to paypal payments advanced and this costs five dollars a month. You can learn more about this by just clicking on any of the sign up links here and also the compare all paypal products option here which will take you through various options that you can choose from but for now we’re just going to use paypal payments standard. Now once you’ve signed up to one of the payment options you will then need to get your api details. Now while we’re building the site you want to do it in test mode and sandbox mode so that all of the transactions are simulated and you can make sure that everythings set up properly. Once you’ve done that you can come back and switch it to live mode and then you’ll be processing live genuine transactions that are bringing money directly into your paypal account. But to start with we need to use the sandbox mode and then click on this link to get all of your sandbox api details. Once you have them, just fill them out here and I’m going to pause the video while I do that. Once you have done that just click on save settings and that will update the paypal module with your test api information. Next you want to come over to the payment section and here is where you can enable or disable the different payment gateways so right now you can see we have paypal, bankwire and payment by check activated. Now it’s likely you’ll only want paypal activated so to deactivate to bankwire and payment by check just come to the right hand side and click on disable. And once that refreshes we’re going to do exactly the same for payment by check. So we just need to come back to payment again here and disable that one as well. And let’s just double check that we only have paypal enabled now and we can see that at the top there and if we just into our site let’s take a look at our cart and check out. And we should now see that paypal is the only option down at the bottom here so that’s perfect. Now one of the things you will notice here is that it asks some details like the delivery address and soon. But this country drop down currently only has the United States so to fix that we need to come across to the localization tab here and down to countries. And this will load a full list of the countries that are within the system and if we come down here to display all of the results and let that load for a second, now we can come all the way to the bottom. We can select all the countries and once you’ve got them all selected you can just come down and hit enable selection and apply. That will then make all of these countries available to use in the checkout so if we just jump across again now and refresh, we should see that we have all of those countries now available to select during the checkout. And if we just take a look here we can see they are now all available for us to use. So that is the delivery address and paypal integration taken care of. Remember this is using the paypal sandbox in test mode right now so once you’re happy with your site and you are ready for it to become fully transactional and start taking payments, remember you must come back to the modules, payment, up to paypal, click on configure and then come back and set it up with your live paypal API settings rather than the test or sandbox mode. So don’t forget that, otherwise it will not be transactional. Once you make the change to live, which I’m not going to do for the purpose of this tutorial is make sure your check out process is working entirely so perhaps change the product price to be one dollar and get a friend to buy the product and go through the paypal check out process and make sure that first of all the payment method if working and the product delivery is working as well. Remember to do that when you are ready to go live with your site. Now that we’ve entered some products and set up our basic settings, we can set up our payment method for our Prestashop site. There are several payment services on Prestashop but for this tutorial I’m going to install Paypal. To install Paypal go to Payments, Gateways and then click Paypal. Click Install and it’ll go ahead and do that. When it’s done, we have to pick the Paypal checkout service for our site since there are a few different options. Paypal standard is free and the way it works is that a customer will add an item to their cart, click checkout and be taken to the Paypal checkout page. They’ll need to log in to Paypal and make the payment on their site and afterwards they will be redirected to your website. However, if you want the checkout procedure to happen on your site, that will cost $5 and that is Paypal payments advanced. After you’ve chosen your method, enter your API settings but make sure to do it in test mode first to make sure everything runs smoothly. When you are sure, you can select live mode. Click Save and head over to the Payment section. This is where you can choose which types of payment sections to allow on your site such as bankwire or payment by check. Go through and select which ones you want to be enabled and disabled by clicking the drop down and selecting Disable. One thing we need to fix is the country selection in the checkout section as it shows just the United States. To fix this, go over to Localization and select Countries and a whole list of countries will come up. Scroll to the bottom to display all the results, select all and click Enable Selection and Apply. Now all the countries are there in the checkout process! Now we can spend some time customising the look and feel of Prestashop store. I will show you how to download and install themes but be sure to checkout the links to the free themes below. Then I will show you how to customise the default theme to your hearts content. iKon – Featured in the tutorial from the official forums. BlackHawk – Responsive theme from the official forums. PrestaDevelop – Lots of free Prestashop themes to choose from. PrestaShop Forums – The official free themes forum. So let’s take a look at changing the appearance of our digital shop. Now just like WordPress you can get a range of themes on Prestashop and they have lots of official themes here that you can buy but if you Google around for free Prestashop themes you can find them. Here’s a site listing twelve, different ones to choose from and you can also go into the forums and find free themes to download and install. So what you will do is I’m just going to show you the installation of this free icon theme and you can download the zip file here. Once you have the zip file, you just need to come to preferences and themes. Then once that has loaded you can see here you can change the settings for your current theme, here you can look at other themes to buy and download but on the top right corner you can add a new theme. So if you click on that we are going to upload the icon theme that I just downloaded so just click on add file and select the file. Then click on the save button and that will upload the theme and install it on your site ready to use. Once that is done you’ll get a message like this and if you scroll down you can see the theme is installed and now what we need to do is click on use this theme and that will activate the theme for our shop. It will also ask you to enable disable some modules and we’ll talk about the modules a little bit more later on but for now just click on save. And once you’ve done that it will ask you to regenerate the size of the thumbnails as different themes use different sizes so to do that just click on go to the thumbnail’s regeneration page, and once that’s loaded scroll all the way to the bottom and click regenerate thumbnails and OK. And that will go out and regenerate all of the images for you. Once that is done we can take a look at our site and you can see it is now using the new theme that we have selected and you can see the difference here immediately. But if you want to customize your theme you just need to come to preferences and themes, and I’m going to renable the default theme here and customize that but if you want to customize any theme you’ve installed you can just come here to edit the logos, and then hit the advanced settings button here. So I’m just going to reactivate the default theme and use that as a basis for my customization. Again you will need to enable the modules that it suggests automatically and then also regenerate the thumbnails and then we have the basic theme back installed and ready to tweak as we like. So let me just regenerate those quickly. OK and then if we take a look at this site and refresh it you will see the change in the theme immediately. And here it is. So let’s take a look at how we go about customizing the default theme to our liking. Now if you look at the home page you’ll see we got this image at the top, we need to change the logo here, these images here we can replace, we can replace these images or disable them, we’ve got different text to fill out here, link to our Facebook shop and some store information, etc. So let’s start by uploading a logo. So to do that just come to preferences and themes and here in the logo section just click on add file and select your logo. Once you’ve done that you can just click on save and that will upload and update the logo for you just like that. Next if we just refresh the site we should see our new logo in place and you can see that there. Next let’s take a look at changing the image boxes here because they’re not really relevant to our site so here we need to go to the theme configurator, and here you have a range of different options that you can enable and disable here. We’ll come back to these, first of all let’s take a look at the image banners. So if we scroll down and here you can see we have these two images here which are also reflected here so if we go in and edit this we can choose a different image which I’m going to do and you can also decide where it links to for example if you are promoting a specific product in this image you can link it to the product page and then you just hit save and that will upload your replacement image which you can see here and now we just need to do the same but for the other image so I’ve selected the file here and again just hit save and that will update that image for us as well. So now if we come back to our shop and refresh the homepage, we will see those changes which looks like that. So now let’s take a look at how we change the slideshow here. If you come to the module section and select install modules and enabled modules, here we can change the images in the slider. Now as you go through this list you will see that there are various different options, for example this banner block option if we go into configure that you will see that this gives us the option to change the banner that you see at the top of the page here and a lot of the things you want to change in the appearance are controlled under this module’s section. So to change the images in the slider we need to come down and go to the image slider for your home page’s section and here you can see look you can configure the featured products that appear on the home page as well here and the different settings around that so remember a lot of the settings and customization is done in the module here. And the image slider for your home page we can just come in and click on configure and that will allow us to change the different slides that get shown. So I’m just going to delete one of the slides here, just to show you how this works and pieces together. Then let’s edit one of the existing slides so you can see how it’s constructed. Now this is editing this slide so you can see the image there and how the text and button overlays, and they’ve just created the text and the little shop now button down here along with where the slide links to. But I’m going to change mine to look like this and if we just save that quickly that will upload the image for us. And you can see that there and if we jump in I’m actually going to remove the additional text and formatting that they had in the editor here, feel free to use it if you wish. And just hit save and I’m going to repeat that process for the other slides so I’ll just pause the video while I do that. So you can see that is done now and if we go and take a look at our home page, you can see how those images have been loaded in as we want them. So next let’s take a look at changing this top banner here and you can actually completely enable or disable it if you want. If you come to the module section first let me show you how you edit it. Remember install modules, enabled modules and we want to configure the banner block this time which displays a banner at the top of the store so if you click on configure and up here we can choose to change the image and also link it up so I’m going to do that and once you click on save file that will upload, you can see it’s replaced with our image now and if we come back to our site and refresh it, you will see that this top banner gets replaced with the new one we just put in up the top there. Now you can choose to disable that entirely if you come to preferences and themes. Then load into the theme configurator. On here you have different options of things to turn on and off so we can say display top banner, no and click on save. And once that updates if we refresh our site you will see that the top banner has been removed which ends up looking something like this and you can see that is gone now and if you wanted it to reappear it, you would just come back, display top banner hit save. Then refresh the site and it will instantly pop back into place. And there you go. You can see it at the top there. Now let’s take a look at removing these images now you can either edit them or replace them with your own images, temporarily disable them or delete them entirely because this is just a sample shop that’s not got many products or categories loaded in I’m just going to remove them entirely. So to do that you come to your theme configurator and scroll down and you’ll see these images all under the home hook. Now you can either edit these and disable them and then save to disable them one at a time or if you don’t intend to use them ever or replace them, you can select to delete the item entirely which is what I’m going to do for each of the five images so I’ll going to pause the video while we do that. OK so they’ve now all been deleted and if we move back to our home page and refresh it, you will see all of these images here disappear. Here we go. So they have now gone. Let’s move on to configuring these sections here. So first of all we’re going to take a look at updating the Facebook so if we just come here and click on configure we can come into that and update it with the ULR of our actual facebook page like this and hit save. And as soon as we save that we can jump back to the page refresh it and see that change appear instantly which looks like this. Next we want to customize these text blocks so if we come back to the configurator here it’s the display the custom cms information block and you can actually turn it on or off if you want but let’s configure that quickly. So here you can see the blocks of text that are currently in place so let’s just edit that quickly to show you how it works and I’m going to put my own text in place so let me just pause the video while I do that. So you can see I have updated the CMS block here with some custom text and I’ve just clicked on save which has updated. If we come back here and refresh you will see that text has updated here. So now I’m just going to update this text block now as well in the same way. So you can see all the updated information here and next let’s take a look at updating the store information and where these link to. Again you come to the theme configurator, the display your contact information, you can click here to configure it and update the details here or you can choose to disable it completely by clicking here and clicking on save which will remove it from the theme entirely. Here you click on configure to update the links to all of your social networks and the accounts which you see down here. If I just refresh the page quickly you will see that store information has now been removed and there you can see it is gone. So the home page is looking pretty good now I think we just need some header navigation here so let’s take a look at how to add that. So to add our header navigation if you come over to the modules and have installed modules and enabled modules, remember here is where you can customize a lot of the things about the site and how it appears. To add the header navigation we just scroll down to the top horizontal menu option and click on configure. This will give us the option to add pages to appear in auto navigation so we might add all of the different categories of products we have here and then we could also add a link to our about us page and enable a search bar. You can also add custom links here going to wherever you want but once you’re happy with that just click on save and once that’s updated we’ll take a look at how that’s affected the site. OK so now if we refresh this we should see a header navigation bar come into play. And there we go, software, videos, e-books, SEO, about us and that takes us into our relevant categories here and we’ve got the search bar there, again that’s easy for you to disable and you can see how that is looking there. Now the footer menu has lots of different options here so let me show you quickly how to configure that. If we come back to the modules element, again this si where you make a lot of the changes to the content of your site and the layout and here we come down to the CMS block and click on configure. In here we can choose exactly what appears on the footer and decide whether to include or exclude different pages and the different links here so we can get rid of displayed by Prestashop in the footer and let’s just say let’s get rid of the link to the sitemap just to show you that in process. So we should remove this message along the bottom here and this site map here when we refresh, so let’s take a look at that. And you can see that information is now gone. So the last thing that I want to go over with you regarding the design and layout is how to change the content of the pages that are built in like this so we have like the about us page, if we go back we have the delivery page here for example and you’ll see that’s loaded with dummy content right now. So let’s take a look at changing those. So to do that is really easy you just come to the preferences and CMS option, find the page which you want to edit and right now we hav the delivery page so let’s click to edit that page and I’ll show you making a quick change so you can see how it works and lets just add the word test in to the text here and click on save. Then if we move across to the page let’s wait for that to update and refresh it we should seee the word test appear here. And there you can see it has come in and that is how you edit all of the static pages if you’re wondering, just come into preferences, CMs and edit them there. So that wraps up the appearance part of the tutorial. You now know how to customize it to your heart’s content. Remember that some other settings are in preferences and themes and then you go into the theme configurator and you can enable and disable different elements there as well as upload your logo here. Then for any bits that you can’t customize that aren’t available here you go to modules and modules, and then make usre you’re viewing all of the installed modules and enabled modules and just scroll the list to find the module that you want to customize and you can really make it look exactly how you want it to look with no time at all. Similar to WordPress, you can choose which theme you want to use in Prestashop and there are many free ones you can find by Googling or looking in forums. To install a new theme, you need to download the theme’s zip file, click on Themes in the Dashboard and select Add new theme. Add the file you downloaded and hit Save for it to upload and install the theme. When it’s done, you’ll see the theme now uploaded in your Dashboard and to use it, all you have to do is hover over it and click Use this Theme. It’ll ask you to look at some modules which we’ll talk about in a second and the next page will have you regenerate thumbnails. Click Go to the thumbnails regeneration page, scroll down and click Regenerate thumbnails. If you go to the homepage of our website, you can see our new theme in our Prestashop. So let’s see how we can customize it to our liking. Go to Themes and you can go through the Advanced Settings or click through the tabs to change icons, logos and things like that but for this tutorial I’m going to re-install our previous theme and configure that for you to see. To upload your new logo, go to Themes under Preferences and you’ll see a tab for Logo in the Configure Your Theme Section. Click Add File, upload your file and click save. To change some of the boxes on the homepage, click on Modules and go to the Theme Configurator. You’ll see several different options to change but let’s check the image banners first. Scroll down until you see the preloaded images which we want to change and click on Edit to enter the information for our own images such as size, the link and title. Once you click Save, you can refresh the site to see that our new images are there. So now we can go ahead and change the slider once you changed the image boxes. To change the slider, go back to Modules and select Installed Modules and Enabled Modules. A good thing to remember is that in this section there are lots of options to change for the images and other customization options so this is where you will do that when you need to. So go down to Image Slider and click Configure which will bring you to a new page to upload a new slider image. You can delete, disable or edit the images that are already there. You can edit the image and change the text, the target URL, title, caption, and description. Once you change the slider images to how you want, you can go in and change the banner block too. So go back into Modules, Installed and Enabled Modules and click on Banner Block. Upload your picture, enter the banner link and description and then hit save. If you don’t want to have a top banner at all, you can disable it. Come to Preferences, Themes and click on Theme Configurator. You can scroll down to where it says Display Top banner and tick that to No. Let’s check out the images below the product list. Since this is a tutorial, I’m going to go ahead and delete all of them. To do that, go back to Theme Configurator and go down until you see the images we want to delete. Like the other images we went through earlier, we can edit them, disable or delete them. Now we can update our Facebook page so head back to the Theme Configurator and select Configure under Display Facebook block. Enter your Facebook page’s URL and hit save. To customize the text blocks you see next to the Facebook plugin, go back to Theme Configurator and select Configure under Display the Custom CMS information block. You can actually disable these boxes if you want. Click on Edit to change the text and hit save. To configure some other settings like your contact information and social media networks, you can do all that in the Theme Configurator. Like before, you can edit or disable it. So once you’re done with that, we can change our header navigation. Go back to Modules, Installed Modules and Enabled Modules. Click on Configure under Top Horizontal Menu and you’ll be brought to a page like this. The header navigation will allow our pages to be in auto navigation so we can add some categories, links to other pages and add a search bar. Once you’re satisfied with the changes, click save and refresh the page to see the changes. Next we can make some changes in the footer. Go back to Modules, Installed and Enabled Modules and select Configure for CMS Block. Some things you can change in the footer are links to home page and what information to display. Now the last thing to do is to change the dummy content that’s been loaded in like about us and delivery page. So head back to Preferences and click on CMS option to select which page you would like to change. On the delivery page we have even more options to change. You can change the meta titles, description, content and things like that. Hit save once you’re done. Just like you can add new features and functions to WordPress with plugins you can do the same with Prestashop modules. There are a huge range of modules to choose from that make it easy to create Google Shopping data feeds, add Google Analytics Ecommerce tracking, add rich snippets and so on. Official Modules – Choose from a range of free official modules. PrestaDevelop – Lots of free Prestashop modules to choose from. PrestaToolBox – Offer a range of free modules for you to use. PrestaShop Forums – The official free modules forum. So now you’ve got a basic digital product store set up that’s fully transactional, let’s take a look at how we can build on that further by installing modules. Now as Prestashop module works just like a wordpress plugin. Once you install it, it adds new functionality to your store for you and in Prestashop if you just come to modules and modules you can see a list of different modules that you can install as well as ones that you already have installed. Coming to the modules and themes catalog you can browse through various different modules here, one that feeds your product into Amazon Marketplace, one that reminds people about their abandoned carts and you can also install templates on this page as well. Now a lot of the Prestashop add ons are paid for and you can have a look at the main marketplace website over here to browse through them and if you do a google search for some free prestashop modules, you can find there’s as well here some on the official site and I’ll put these links for you underneath the video, there’s seven pages of free modules here for you to choose from. And here on the Prestadevelop store there’s a lot of free modules that you can take advantage of here as well and again I’ll put the ULR for this underneath the video. Just as a note some of the pretty good modules I’ve picked out, one if the Google Analytics E-commerce PHP module, this will actually integrate prestashop with an google analytics e-commerce tracking for you so you can see exactly which products are selling and get the actual values of the sales directly within Google Analytics itself. Having Google Analytics E-commerce set up is pretty critical for any e-commerce store so there is a plugin available to do that for you. Then we have the google rich snippets module. This adds all of the core rich snippets that you often see in the search results. For example with my blog I have the review ratings here and sometimes with e-commerce results you can ratings here in the review information but also you can find the prices and the different star ratings there so that is what the rich snippets modules does which will help your SEO and rankings naturally. Also there is a SEO expert module that allows you to really delve in and tweak the SEO settings although Prestashop comes with a pretty good SEO setup out of the box so this isn’t necessarily needed. It’s only if you really want to tweak things further. And of course you can integrate everything with Aweber or Mailchimp whichever is your preferred email newsletter subscriber. And be sure to check out my separate email marketing tutorials series on the blog to learn more about how to take advantage of that. Just spend some time browsing around the different modules on the dedicated prestashop site, you can see all of the featured modules here, new modules, they’re all broken down by category, it’s pretty much a module to do anything you can imagine with e-commerce. There’s so many different ones here to choose from. Once you’ve found a module or modules that you would like to install, use the modules menu here and in the top right hand corner you can select a new module. All you need to do is choose the zip file you’ve downloaded so for example here, we choose, let’s say we want to add the paypal module, let’s just find that cause it’s free we can just click on that. Once you’ve registered your account you download the zip file here, then you just come across to modules, add a new module and upload the zip file here and then you will be able to configure it all so that’s an introduction to prestashop modules, it works very similar to wordpress plugins. Anyone can add new functionalities to their prestashop store in just a few clicks. Prestashop modules are similar to the plugins in WordPress. To find modules to install, click on Modules and Themes Catalog and you can look through different modules such as Amazon Marketplace and Abandoned Cart Reminder Pro. Some modules are free but most are paid so you can look through the Prestashop database of modules or Google search to find some free ones. I’ve included a few free modules underneath the video for you to check out. These are some of the modules I’ve personally chosen to use. Google Analytics E-Commerce PHP Module which integrates Analytics and Prestashop tracking analysis. Google Rich Snippets which adds the core rich snippets like the ones you see in my review articles. SEO Expet Module is good but not absolutely necessary since Prestashop has their own SEO setup. Be sure to also check out the module for the email newsletter you use to integrate that into your Prestashop site. To install a module, click on Module and in the top right corner you will see Add a new module. Click that and upload the zip file of the module you downloaded earlier. To help you follow the tutorial a bit better and understand how everything fits together I will keep the demo site that I built in the tutorial live. So there we have it – everything you need to know to be able to sell digital products online with PrestaShop. If your looking at all of those videos above and feeling a little overwhelmed then don’t worry – it really is easy to follow along, anyone can do it! Once you have your store and products setup always be sure to make a couple of test transactions to ensure everything is workingproperly and the digital delivery system is doing its job. You also want to make sure you have enabled all of the caches in the Advanced Parameters > Performance section to improve site speed and load time. So that concludes my Prestashop tutorial, you now know everything to be able to setup your own Prestashop and tweak it to your hearts content with new themes & modules. Disclaimer: This post was sponsored by Prestashop. When I sell a sponsored post people are purely buying my time to look at something and not my opinion. If the buyers product/services performs poorly in tests I will publish that without refund. If you want to learn more about my sponsored post requirements please read this. You can view the live site I built in this tutorial here. I’m using megneto and after reading your guide, now it’s time to move to prestashop thanks matt. Actually I have a heavy background in Magento but getting it setup to sell and deliver digital products is a nightmare and complete overkill! Hi, Matt thanks for sharing. Is it not enough using Woocomerce? I guess using prestashop is more powerful but maybe it is not worth learning about this if Woocomerce can do the job. Hey Matt, I remembering asking you for a Magento tutorial some time ago but looks like I won’t need that now! Thanks! Sounds pretty simple enough to set up the shop. But the selling part won’t be that easy and the product has to be something special for it to be a viable online business. As a matter of interest what domain name would you choose for a site like this? Would you go for a generic name or a more general name? It depends what you want to do, perhaps you might just focus on selling bots then I would go for something branded around that. Getting the sales isn’t too difficult with the right products at the right price, all of which is in your control! Unless you use PPC or other types of paid traffic, I can’t see where the traffic is going to come from? This type of sites won’t be easily ranked by Google using normal SEO. Why wouldn’t it? Put good content on the home page, make sure each page has unique content, the category pages are taken care of and unique detailed product descriptions along with good on page SEO and a social media strategy will do the job. Having spent about 2000 hours (I’m not kidding) on an affiliate site recently and ending up being thrown out of the 1st 200 entries by Google, I have no enthusiasm or energy left in me to go through all that again with another site for the time being – The negative emotional effects are not easy to deal with when such a thing happens. Well that is the nature of the game unfortunately. Putting all of your eggs in one basket (in this case Googles basket) is a bad business decision. In general, doing review sites on one product is not a good idea (it’s a big risk) but I realised it in a hard way. But still hoping Google will revaluate my site – I did delete some of my internal links yesterday. I hope that was part of the problem due to duplicate content. The proper way of doing it, is the way that you do it on this blog, hence your big success. That did the trick – now back to ranked pages – but the product is shite, so better not get too excited! Other than selling ebooks, what digital items would you recommend for a site like this? By the way – does Presto Shop have coupon facility? Thanks :) And yes you can set that up! I’m 13 years old and have been a follower of your blog for a while. I’ve been making websites and blogging for 4 years and have decided to start a blog about internet marketing, SEO, programming and WordPress; 4 of my favourite things in life. Yes, I’m that nerdy. Despite my 4-year experience with blogging, I’m completely new to this sort of thing. Most of my websites have revolved around kids’ online games, a pretty easy niche. I praise the work and the hours you’ve put into making these lengthy tutorials. However prestashop is not suited to sell our info-products efficiently. In terms of conversion It’s far behind tools like OptimizePress. I’ve carefuuly watched the videos and waited for the time a Salesletter was going to be built. That did not Happen. And the price should not be displayed straight at the beginning of the salesletter, but only at the end when interest and desire have been aroused into the prospect and when enough value has been built. So from the point of view of seasoned info-product marketers/Sellers, Prestashop will not pass the test of efficiency. Maybe for multi product vendors who want to display their inventory. But for direct marketers who want to sell a lot each time and even make produt launches, what I’ve seen in the videos is not suited at all. Anyway, thank you for the prestashop review, it enabled me to judge it if it was worth using it for my product selling ”direct marketing style”. The answer is No and your videos helped me to answer that question. I’ll stick with OptimizePress 2.0 and the whole classic IM mumbo jumbo. For other people with other needs, it may be suited for them though. Like people who sell a lot of physical inventory etc. Matthew, when are you going to make Tutorials about OptimizePress 2.0 and the whole configuration to set up a real salesletter and a real product sale a la ”guru marketing” style? You know what I mean: Jeff Walker Style, Frank Kern Style, Dan Kennedy Style etc… That would be epic. Or maybe make a IM tools of the trade. Nice idea, isn’t it? But I must warn you: it’s a truckload of work and process. An entire team is needed to do their kind of product launched. I know, I’ve been burnt so hard trying to do it. Greetings from a french speaking Internet Marketer. There is a big difference in what your describing here. This tutorial is focused on how to build a site that sells digital products – what you are talking about is a more focused product launch type setup. Love your style of doing sponsored posts. Where did you get this idea from? Just curious. Yeah not many people believe in their product enough to bite that bullet! But they approached me, I took a look at content opportunity and this was born! How do I automate sending digital products to buyers immediately a purchase is made from Prestashop? any additional module is required? or any payment gate and product set up as a virtual one? and btw great tutorial! amazing quality! I know this is a sponsored, but is an AMAZING GUIDE!!! At the beggin i think prestashop was too much for my but with your guide! Was pretty simple!!! So thanks! 2) is really secure to sell digital product? like pdf, mp3 or photos?? No link leechers?? 3) Where i get my paypal appi? I cannot found that. Also i wanna ask you about sellings ebooks.. do u have some tips? I wanna sell also in amazon, ikindle, and google play! ¿u have some experience in that field? tips? Im working on my own book digital publisher!! Well like usual, love ur post/info/videos/guide very very usefull!!! Sponsored just means that bought my time to look at something! I was impressed with how easy and quick it was to get setup with Prestashop though compared to others I have used in the past. If you are going to launch a book I would first make sure you have an audience to launch it to! Hoi Matthew, i am using prestashop and i am trying to find out how to make submenu in the mainmenu bar. i hoop you can help. Is Prestashop supposed to exclusively be used with a new domain, or would it be possible to use this as your shop page on your main site? Feel free to add if that’s a bad/good idea as well. Thx for a great tutorial! There are 2 options available for download in the official PrestaShop addons store, addons.prestashop.com, that can help you with your DRM, just type in “DRM” in the search box and you will find them. Thank you Matthew for your comprehensive tuts. I like videos very much. Prestashop is the tool I am looking for and your instructions help me a lot. I planning to sale on-line my images. Very good for e commerce. Hi, Mathew. Can i link the ebooks in a prestashop site to a salespage? If yes give me an insight. Speak with Prestashop support directly that’s a bit too specific for my knowledge! hello thanks but i need to ask a question am creating a site for digital content (pdf) but when am about saving it say the file is too large to be uploaded . Hi, Thank you for so many valuable information. My product page layer is not compatible I don’t know what. could you help me pls how can i fix it. You can see my error page belove. Where can I find a free module versions of files? I have product for sale for example song and I want to have a lot of files under one product. how can i integrate/convert my own html template in prestashop theme.. I am looking for a way to sell tickets in prestashop. Is there any way I can point prestashop to a script upon payment? This script will generate the ticket number send it to the client’s email.